Serchhip District falls in the heart of the state of Mizoram, located at a distance of around 112 km from Aizawl, elevated at 1281 meters above mean sea level, it lies between 23°35’58’82” and 23°00’20’84” N latitudes and 92°41’06’00” and 92°40’39’63” E longitudes. 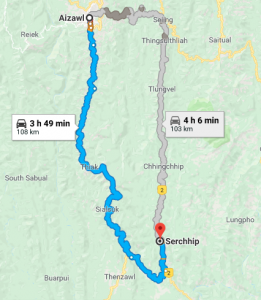 It is well connected with national and state highways, Serchhip is easily reachable from various towns and places of interest in the state. The nearest airport is Lengpui Airport in Aizawl which is located at an estimated distance of 142 km. It is the only airport in the state and is well linked with other cities in the country. From the airport, you can hire a car or a bus to reach the destination. You can reach Serchhip in around 3-5 hours from the state capital. The duration may varies depending upon the route taken. National Highway-54 is the main route taken by majority to reach Serchhip . This route will take you through a green vegetations and small villages. Another route to reach Serchhip is taking Aizawl-Thenzawl road. This route will take you through a winding road and passes the beautiful Hmuifang Tlang. Hmuifang tlang stand at an elevation of 5312 ft. covered by scenic beauty of nature, green grass and virgin forest. The government of Mizoram even run a Tourist resort here and nation wide festival are organized from time to time. Throughout your journey you will be offered with the picturesque sight of great landscapes.